Caroline now has jewellery for sale in her home town Llandudno, at the wonderful Oriel Mostyn Gallery. 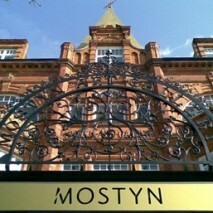 In the strikingly beautiful seaside town of Llandudno is Wales’ leading gallery of contemporary art – MOSTYN. Topped with a landmark gold spire, in 2010 it completed an expansion in which old and new buidlings are integrated in a stunning design by architect Dominic Williams.